Label incorrectly states 33 ⅓ RPM. DJ Buck rules and so does this record. Class! When I first spotted this in the stacks at the record store, I thought "Great, probably another crappy remix that someone put out that doesn't even compare to the original"...But I listened anyway (because Rong has released some great stuff) and...Low and behold I was very very suprised. 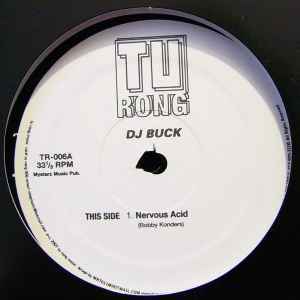 I mean, the original nervous acid is timeless, and this is too. It holds the same form as the orig. (same moody bassline, same slowly rising, building drumrolls) except this one is done on real instruments. I'd be suprised if any drum machines or samplers were used in this at all. It seems all made using just bass, guitar, drums, and some delay and reverb (and a whooshing sound). Still mixes well into my moody house-ish sets perfectly. Maybe not too great for the dance floor, but still a top quality tune. Mixes great with the original too.